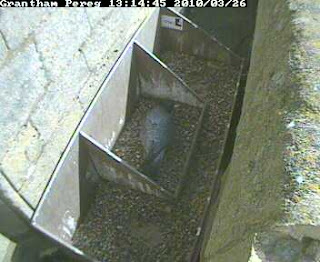 The female birds spent a considerable amount of time in the nesting tray today, between 13.00hr and 14.00hrs. She was seen preening and scraping out the hollow in the centre of the nesting tray. The picture immediately below this text shows her scrapping out the nesting area. She crouches down, with her tail in the air and wings flat on either side. She then kicks back with her feet to create the hollow in which we hope she will lay her eggs.